I did not like this episode on first viewing but it's grown on me. The plot is very believable and a reflection of the corruption that is rife in today's world and there are some excellent fight sequences, including one where Cowley gives it some! I like this episode a lot, lot of well known faces appear in it. I like the scene in the pub where the two heavies pick a fight with Halloran, who only has Bodie and Doyle to back him up. If you have been reading the story this week about the schools in Edinburgh being closed to to poor construction, we can safley say the subject matter is as valid today as it was nearly 40 years ago. I didn't know Anthony Heaton had a part in this until last year, I probably read it on this forum, he played a character a little more conservative than the one I remember him usually playing. I like the change of pace in this episode of Cowley being forced to involve CI5 due to political pressure. Then later events are revealed that make it possible for him to do things his way and on his terms. The pub fight is both well staged and edited. Nice to see Cowley doing a lot of investigating and getting in on the action at the end. This episode excels in the casting of all the guest roles both large and small. The Blake cousins are totall slime balls! This episode contains my favorite line of Doyle-Bodie banter in the series. It occurs in Fish and Chips shop when Doyle says of Bodie, "You'll have to excuse his manners. He hasn't got any." All in all another fine episode that dispels the myth The Professionals was just fifty minutes of mindless action. I always enjoy this episode because - as said above - it has a very interesting subject matter. 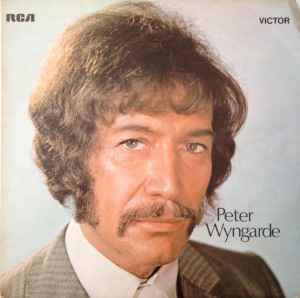 Peter Woodthorpe is very funny as the crooked councillor "another beer and double brandy chaser...". Duncan Preston is threatening as the heavy too! 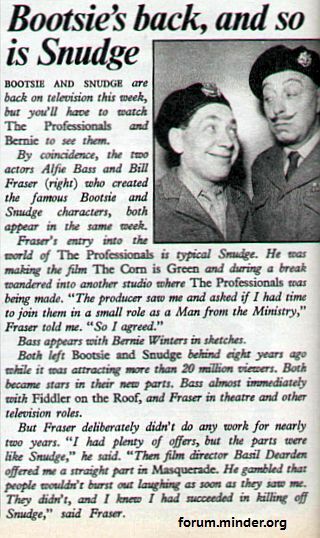 A short piece from the TV TIMES on 18th November 1978 about how Bill Fraser ended up in this one. It's an interesting episode. A bit different from the norm with less action. The corruption storyline isn't the easiest to follow but the casting is spot on with every part. Maurice Denham is a favourite of mine, would have liked him to have had more scenes with Gordon Jackson. Interesting spot was the sign at the chippy, which said that Luncheon vouchers were accepted here. It's an interesting episode. A bit different from the norm with less action. Judging by the plots of the other episodes, this doesn't really seem like a case that CI5 would be tasked with but having said that, I thoroughly enjoy this one. I don't really get what Luncheon Vouchers were all about. Were they given out by employers so that employees could purchase a subsidised meal? I assume the café/restaurant could then redeem the money from somewhere? My dad used to get them at work but never used them. Me and my mates had some MASSIVE KFC meals courtesy of those, I can tell you. Saw it on blu-ray again last night. Probably the most realistic plot ever used in The Professionals, great guest stars, Cowley on top form, enjoyable fight scenes and a neat ending. That's a good point actually; it does feel like a very grounded and believable plot. It reminds me of something like Grenfell Tower, where you've got this run down council estate falling apart and politicians who are more concerned with hushing it up and avoiding the blame than actually fixing the problem. I like the scenes with the couple and the newborn in their flat, showing that the corruption of the minister and Temple Blake has actual consequences for ordinary people. It may not seem as important as terrorists or espionage, but all it takes is a heatwave and the cladding to catch fire and it all ends in tragedy. It's a very well written and witty episode with surprisingly a fair few action scenes of punch ups and the like. Cowley delivers one of my favourite lines in the series at the very end. When the minister is implicated and asks Cowley what to do next, Cowley replies bluntly: "Resign. But we live in a world without much honour, where politicians hang onto office like dirty glue, so I don't suppose you will. Blame is for others." I can think of more than a few members of parliament today who could probably do with hearing those words... It reminds me of the scene at the end of The Female Factor when the Profumo-analogue MP is handed his resignation letter by Cowley, only this time it's a more cynical (Albeit more realistic) ending where Cowley suspects that the minister will just lie to cling to power a little longer. I recognised Del Boys dads dulcet tones straight away.